Apple Watch has launched in certain parts of the world, and we even though we know almost everything about the iPhone-compatible smartwatch, there has been one mystery: battery life. Consider that missing link among the Apple Watch specs solved. It has a tiny 205mAh battery for the slightly smaller 38mm case size, according to the teardown experts at iFixit. An Apple Watch runs out of juice, on average, after about 18 hours of normal use. It lasts anywhere from three hours if it's making a battery-taxing call, to 48 hours if it's performing simple time checks. The 42mm Apple Watch has longer battery life, according to Apple, but it's likely to be marginally bigger in size. It takes 1.5 hours to recharge it to 80% and 2.5 hours to reach the full 100% again. To put that 205mAh number into perspective, Android Wear's longest-lasting watch, the Sony Smartwatch 3, boasts a 420mAh battery with a day and a half of battery life. It leads our best smartwatches list. Even the original LG G Watch and and Samsung Gear Live debuted with bigger batteries of 400mAh and 300mAh, respectively, for truly all-day and almost-all-day battery life with conservative use. The LG G Watch R and imminent LG Watch Urbane have upped the LG's battery size to 410mAh. Moto 360's battery specs give it a 320mAh battery. ASUS ZenWatch is the outlier that has a 1.4Wh battery, which roughly translates to around 370 mAh, and the forthcoming Huawei Watch is set to pack a 300mAh battery. No Google watch beats Sony's smartwatch, though it's clear that every Android Wear watch has still fit in a larger battery than the "iWatch," which is a surprising considering the extreme Apple Watch price. Of course, the upcoming Pebble Time Steel bests all with 10-day battery life, beating its own long-lasting Pebble, Pebble Steel and Pebble Time, which have seven days of battery life. All of that said, how long a smartwatch lasts depends on other two factors. First, the more obvious how much the wearer uses the device, especially how often he or she lights up the screen. Second, is the less obvious question of how demanding that software is. Android Wear, for example, is known to be fairly taxing compared to Samsung's lightweight Tizen operating system, which runs the company's longer-lasting Gear 2 and Gear 2 Neo watches. 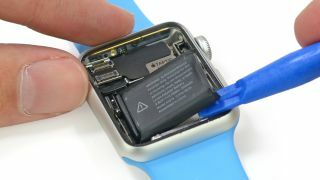 Whether or not you get all 18 hours from this tiny Apple Watch battery may depend on how WatchKit apps are optimized on the wrist. It's really a balancing act between performance and battery life.